Make a run on R&D. If successful, instead of accessing cards you may look at the top 5 cards of R&D and arrange them in any order. A little corporate restructuring is necessary once in a while. With Jackson Howard rotated out this has gone from nigh-unplayable to extremely reliable wincon. If you have the resources to pull off two or three R&D runs in a row it's prettymuch GG. If you pull one of these off and don't see the agendas to stack the deck with, it still serves as reliable information to go fishing in HQ instead. Even if you fail to see things you want to steal you still get the chance to guide your opponent's next few draws. Now that Jackson Howard is gone I don't think Deep Data Mining or Maker's Eye stand up to this. While they provide similar effects they're both more expensive to run, with Deep Data Mining requiring a rig built around maximizing MU and Maker's Eye not pulling as much information. While they both allow you a glimpse into the future, Indexing alone lets you change it. Against players running ambushes DDM and ME may end up getting you killed, while Indexing wont. Adding "Freedom Through Equality" or Mad Dash to the mix makes this even crazier. In most cases, you will want to play it on your first click, to have enough time to come back for any agendas you moved up front. Be careful about Jackson Howard, because his deck-shuffling mambo jumbo can negate effect of this card. But on the other hand, you can use Indexing to lure corporation into wasting Howard sooner that they would want. If you play it, be sure your run will be successful and you will be able to use it, it would be a shame to lose it's powerful effect to Caprice Nisei or Crisium Grid. 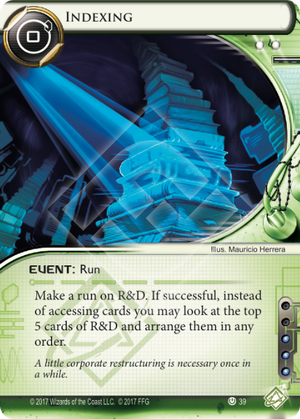 If there are no agendas in five cards in R&D, you will at least now know to look for them elsewhere. With 3 influence cost it's not something you can fit in any deck, but one copy here and there in Criminal or Anarch deck can be very surprising for the corporation. In the way they won't really appreciate the surprise. It's event, so after Comet lands, there will be some pretty nasty combos to play with The Maker's Eye.